Learn the steps to create an effective website for your storage business, one that will increase rentals and positive user interactions. See how simple it is to have a site that looks good and performs well! 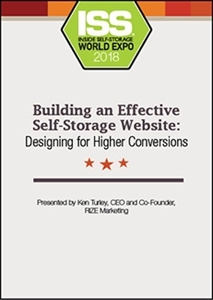 Learn specific steps to create an effective website for your self-storage business, one that will increase rentals and positive user interactions. Our presenter will share tactics and design ideas to keep your online presence up-to-date with society’s expectations of websites and how people use them. Find out how simple it is to have a website that looks good and performs well.